Interactive projector vs interactive display - Which is better? 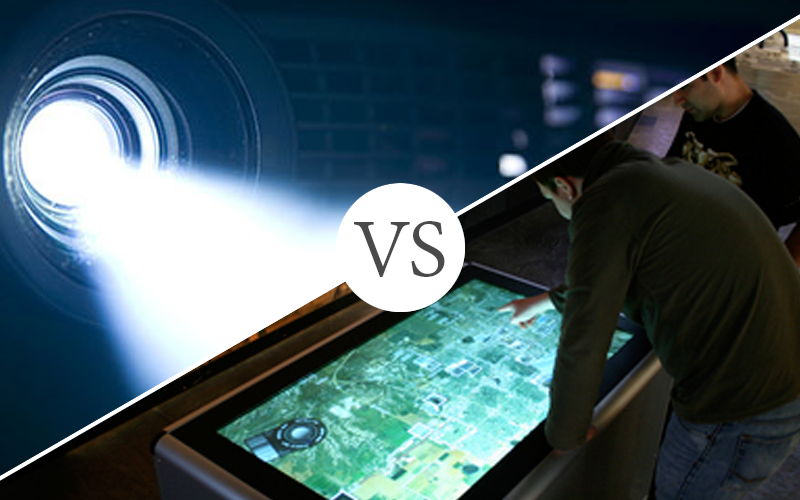 Interactive projector vs interactive display – which is better? This is a question many schools and education providers are asking when considering interactive technologies for the classroom. Both devices have pros and cons, education providers must weigh up functionality, price, maintenance costs and the types of interactive learning that the devices will be used for. It can be tricky to decide whether a touch screen display or interactive projector is the best option, so let’s take a look first at the differences between the two. An interactive projector is comprised of two parts; a whiteboard and projector which features a lens to project images. The projector is usually mounted to the ceiling or to the wall above the whiteboard and is the source of the content being displayed. The whiteboard acts as a plain screen to display the projected content. Interactive projectors enable interaction by tracking movements, either by infrared or DLP technology. – Similar to how the movements of a wireless computer mouse are reflected on the PC screen. – Projector reflects the movements back to the whiteboard. Some interactive projects enable wireless projecting by connecting remotely to laptops, PCs or tablets. Others require wired connections. Essentially, however, they simply project what is on the connected computer. What is an interactive touchscreen display? Interactive displays are wall-mounted screens which display images while enabling touchscreen interaction. They are comprised of only the display screen itself – and usually a remote control – and in many ways, they can be compared to tablets, only much, much larger. 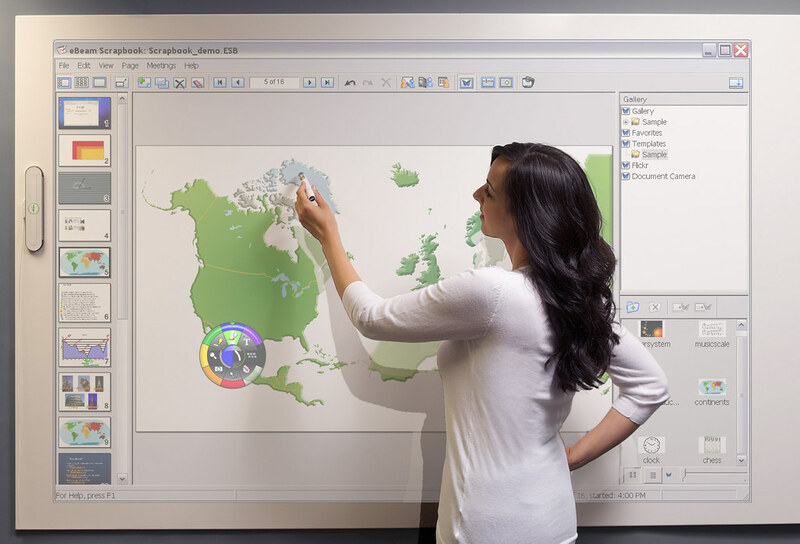 Unlike interactive projectors, interactive panels don’t always require a pen for writing on the display image because they can respond to fingertip touch or palm touch. However, they often feature stylus pens to enable a natural writing experience that is similar to writing on a traditional whiteboard with a dry erase marker. A huge benefit of interactive touch screens is that they don’t rely on the input of other laptops, PCs or tablets. Avocor displays use a Windows 10 interface and can be used just like any other Windows computer or tablet. When additional sources are required, they can be connected to a USB port, or documents can simply be uploaded via a USB memory stick. Since touch displays act like computers in themselves and don’t require connection to other devices, they’re incredibly easy to set up and use with minimal training. Avocor displays use Windows 10, which makes the interface highly familiar and intuitive for the majority of teachers and students. However, open platform capabilities also allow third-party hardware and software to be incorporated for increased flexibility. Interactive projectors, by contrast, always rely on a computer connection. The more expensive models may enable a wireless connection to computers which improves convenience, but ultimately teachers are required to hook up their laptop to the projector every time it is in use. By contrast, interactive displays are room-ready with no need to connect additional devices unless preferred. While discussing functionality, it’s worth mentioning that interactive displays are much quieter than projectors which rely on fans to function. Although the noise of the fans may not be excessive, they may cause irritation to students who are sensitive to noise, or they could distract from the teacher’s voice during lessons. – Brightness and quality of the projection tend to diminish over time. When comparing interactive touch screens vs interactive whiteboards, it’s important to note that the lamps found in the projectors themselves tend to require regular replacement. This can prove costly, particularly in schools which strive to include interactive technology in many classrooms. Furthermore, it is usually necessary to lower blinds and turn off overhead lights to ensure the screen can be seen as clearly as possible, particularly when the image begins to degrade. Sitting in dark classrooms is not an appealing idea for either teachers or students, which means that the projector may only be used for short periods of time. If an interactive projector cannot be used for the entirety of a lesson, it is unlikely that students will really experience the full benefits of an interactive classroom. There really is very little competition between interactive display vs whiteboard and interactive projector when it comes to image quality. Displays can offer a crisp, colourful, high definition image that will not degrade over time in the same way that a classroom projector will. Image brightness will not fade on an LED display, many models even allow screen brightness to be adjusted depending on the brightness of the room. This can help to minimise eye strain. There’s never any need to replace lamps or other elements within an LED display, either, which makes them really easy and affordable to maintain. When comparing initial purchase costs of interactive touch screens vs interactive whiteboards and projectors, displays tend to be more expensive. For schools on a budget, this can be off-putting when assessing the affordability of interactive technology. These factors tend to mean that overall costs of an interactive display vs whiteboard and an interactive projector are around the same. Interactive displays require little to no maintenance since there are no parts that need frequent replacement. It’s also vital to remember that the image quality of a projector will always diminish over time. Subsequently, while initial investment in the device was less than that of an interactive display, the investment does not stand the test of time in the same way. For schools working to strict budgets, it makes sense to assess the longevity of technology to understand whether an investment is worthwhile. In the case of interactive projector vs interactive display, the display tends to be the more sensible investment despite the higher initial costs. 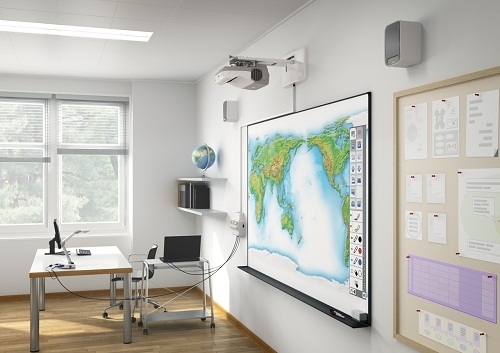 Interactive display vs whiteboard and interactive projector – which wins out?